Do you have sleepless nights and feel uncomfortable in your bed? Are you tired to count sheep trying to fall asleep? Or maybe you can’t stand people talking loudly in public places when you just want to think your own thoughts? Science knows solutions to your problems. Monotonous white noise sounds will help you to forget about the world and to get rid of all the distractions. It’s good both for concentration and relaxation. 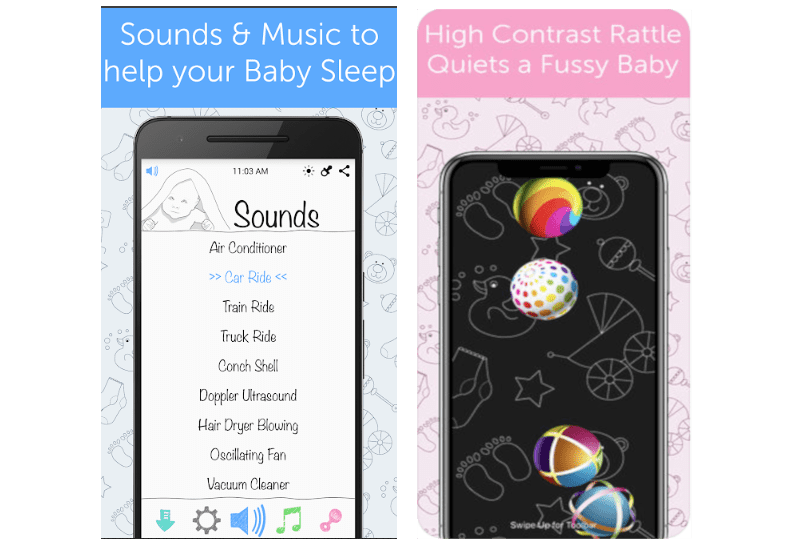 What is more, white noise apps are perfect for parents with babies as it makes infants fall asleep almost immediately. 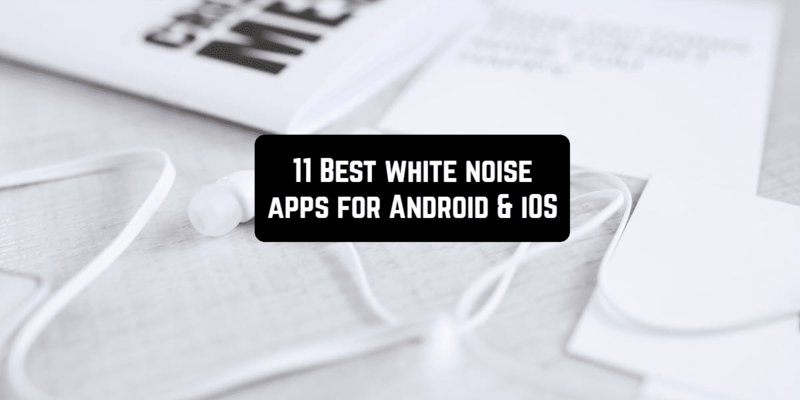 Here are the best white noise music apps you can find. This app is created for people who want to block all the sounds from outside for any purpose. This free version contains 40 amazing sounds. Besides the well known white noise, you may try noises of other colors like brown, pink, etc. The app also provides some mechanical sounds, like a fan or an air conditioner, and sounds of nature: heavy rain, ocean waves and so on. What is more, you can record your own soundtrack or mix your favorite sounds to create a new melody for the better experience. A nice bonus: White Noise Lite is set with an alarm, which will make excellent not only your night sleep but also waking up in the morning. The app is perfect for those who start deepening into a wonderful world of white noise music. This app is probably the best for parents who have a fussy baby. 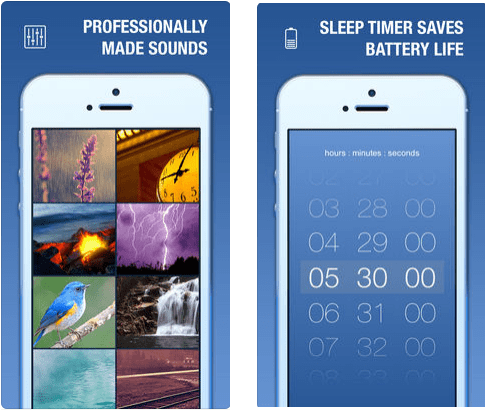 It is proved that white noise is more effective than a lullaby, so using this you can save the precious hours and get your kid deep and sound sleep. 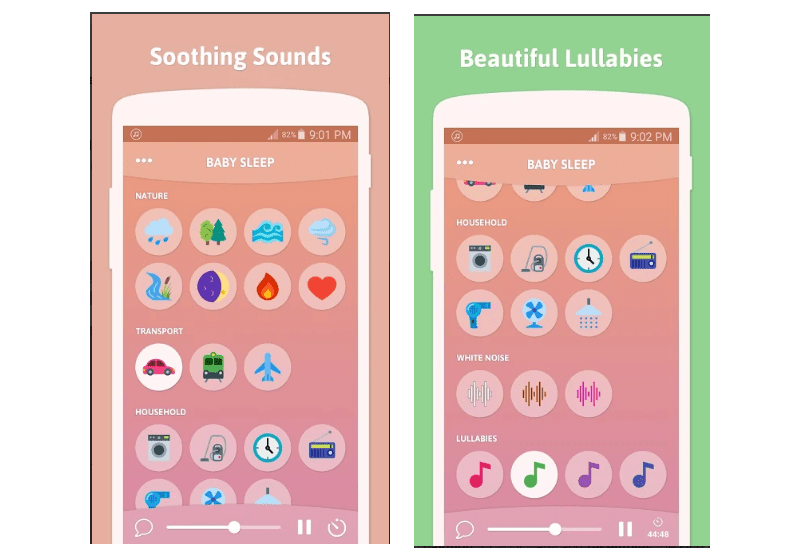 The White Noise Baby has a wide range of relaxing sounds of different kinds, including classical music track. According to scientists, white noise not only helps a baby sleep but also makes it stay asleep despite various nuisances. 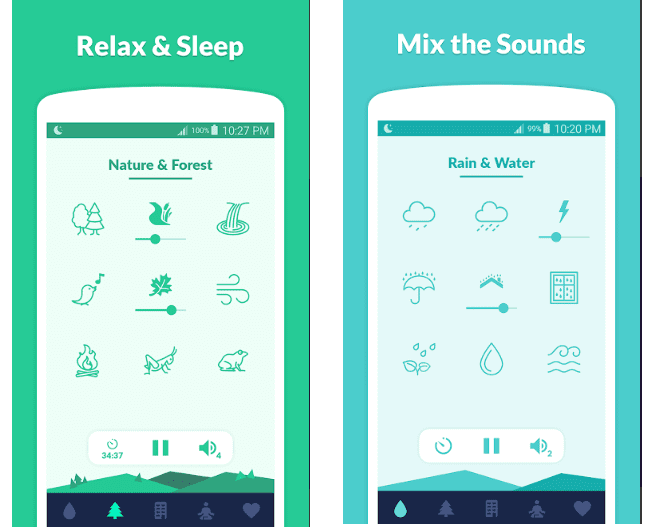 The app generates an infinite melody which will calm an infant down and allow it and the parents to sleep the whole night. You can set a timer to stop sounding after a period of time, but if your baby suddenly wakes up, the app will react to the crying and start generating sounds again. Some babies may be quite noisy in public places for different reasons. This app provides baby rattle to distract your child and calm him or her down. What’s more, in the app you can find different tips on how to treat your baby, create comfortable conditions in the baby room and many others. All this is available in a free app on Google Play. For the iOS users, the small price is charged. Another app which would help you sleep soundly. 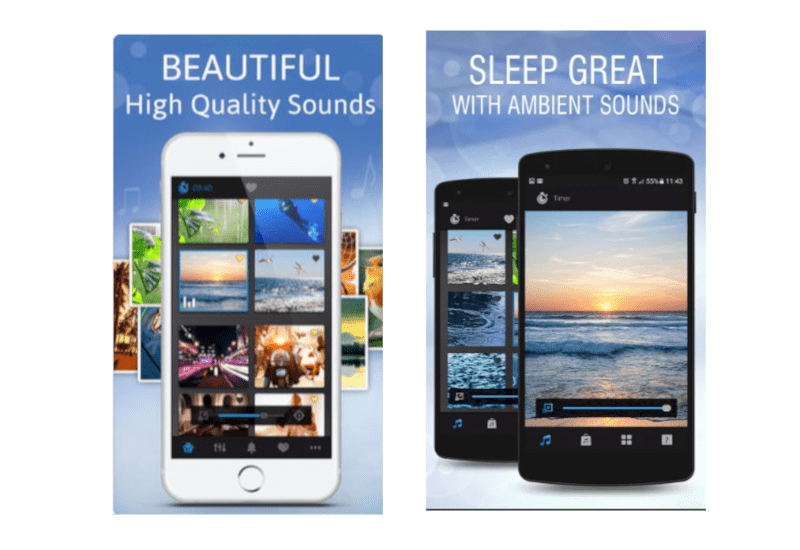 White Noise Sleep Pillow Sound has a large variety of calming noises, naturally recorded and mechanical sounds which will make you fall asleep in few minutes and isolate you from the noisy surrounding. The app is also set with a timer with a soft fade-out. You can mix different sounds with any volume you like. The app is very convenient as it can be run in the background while the device is locked. Wonderful pictures will help you deep into the atmosphere of the relax and silence. White noise apps are also helpful if you have a baby. This app is good for you too, though. White Noise Baby Sleep Sounds provides about 20 different calming sounds which would help you in parenting or give you relax deserved after a tough day. You will not have to sing lullabies ever again! There are 4 lullabies included as well. You can mix the sounds if you want. All the soundings are infinite, but there is also an opportunity to set a timer and the music will slowly fade out when necessary. The app has no full-screen ads and works offline, what is more, it has very simple and funny interface. A small range of sounds is compensated with a light weight of the app. This app specifically focuses on getting you the most comfortable sleep. There you can find 32 high-quality tracks including rain, city sounds as well as meditation sounds and noises of different types. The app has a timer which allows stopping the music at any time and it doesn’t require the internet connection. With this app, you can combine different pieces of noise using the mixer: it’s open to your creativity! 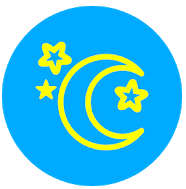 This app is perfect for those who have decided to improve their sleep habits. It has 52 different relaxing sounds for any taste, and you can combine them using a very simple and convenient mixer. Moreover, you can share your melodies with the community and check the best mixes made by other users. The app perfectly runs in the background, so you can use other apps while listening to your melodies. In addition, the app is provided with some training programs on different topics, such as “better sleep”, “deep sleep” or “stress and anxiety relief” which would help you improve the quality of your sleep and relaxation and make your life easier. For many people, the sound of rain is the most relaxing melody. 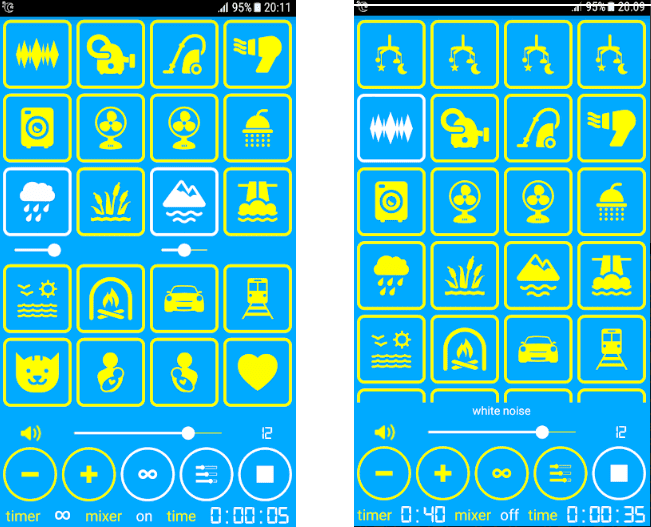 This app has more than 35 different water sounds to make you relax, forget about the outer world and concentrate on yourself. 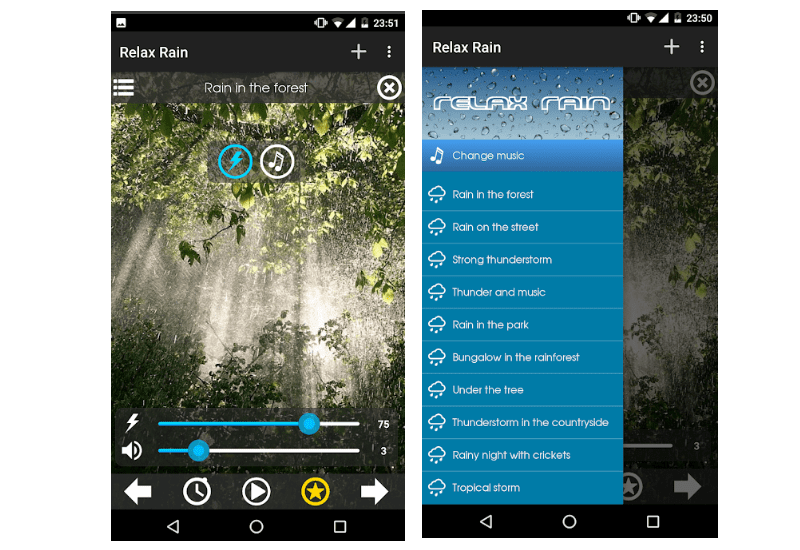 This is the largest rain sounds collection available on Android. 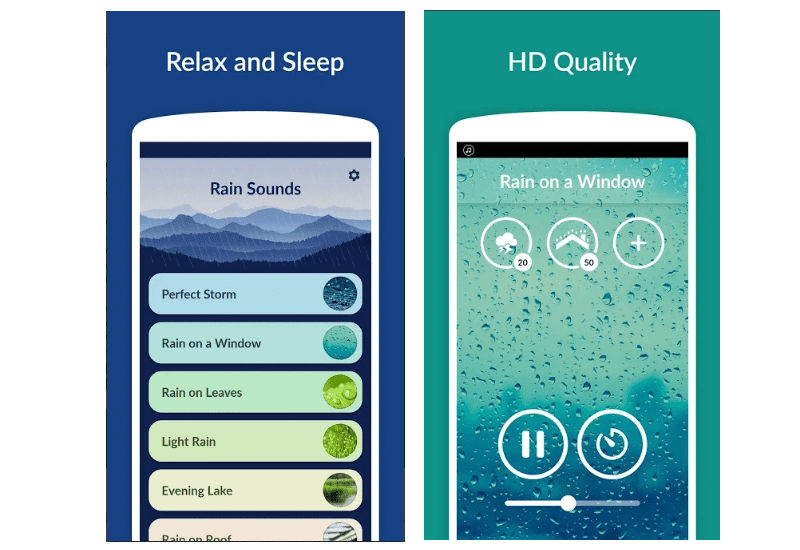 Moreover, the app provides the opportunity to mix other melodies with rain sounds. The app is set with a self-closing timer and it is necessary to note that it has a very beautiful design which would take you back to nature. Another rain sounds collection. The sounds of rain, ocean, and thunder can be mixed with amazing piano melodies. All the sounds are very realistic and high-quality. A fade-out timer is also provided. This app has a very simple interface and beautiful background picture. It is perfect for reducing stress when you are tired of a hectic pace of the modern life. 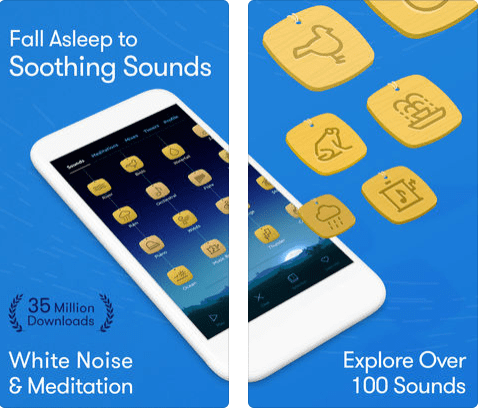 Getting back to white noise, this app is also good not only for people with sleeping problems but also for those who want to improve their productivity and increase the level of concentration. The app has a wide range of ambient sounds and mixes which are available in HD. The interface is very convenient, you will love the way to mix your own melody. 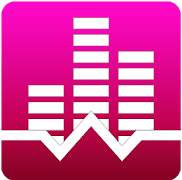 In addition, the app makes the statistics for the sounds you listen to frequently. The next app you may like goes for iOS and has many cool features. The professionally made melodies will help you to fall asleep, in your yoga practice and meditation, at work and so on. The app has a timer and a background mode. What’s more, it can turn your device into a photo frame by hiding all the interface, so you can forget you are surrounded by any gadgets. If you like any sound, you can send it to your friends. This app is designed both for iPhone and iPad, so you can enjoy it on any device. And one more good app for parents and their babies. The app has a very cute design, so you will definitely love it! It has about 20 different natural and mechanical sounds, including white noise, and four pretty lullabies. In addition, with this app, you can record the “shh-shhh” sound yourself, so your baby will feel your around during the whole night. 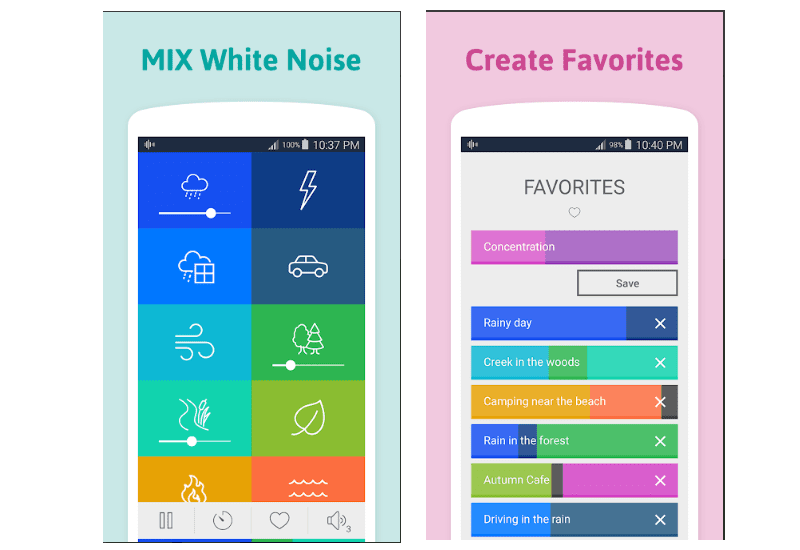 I hope these white noise apps will bring harmony to your life! Enjoy your sleep and daily routine without any nuisance.